I know it’s hip to love quinoa, but I can’t help it. I love quinoa. I would eat it even if it was considered junk food. That toasty, nutty flavor – not to mention the texture – adds character to any dish, and is worth integrating into any diet, no matter what. Luckily, it’s been lauded as a “superfood.” Basically, that means it’s really good for you. More specifically, it has twice as much protein as cereal grains, less carbohydrates, and just the right amount of healthy fats. It’s also a complete protein similar to meat and eggs because it has all the necessary amino acids to help build muscle. People often get confused and call quinoa a grain. It’s not. It’s really a seed. But it doesn’t really matter what you call it. It still tastes good. 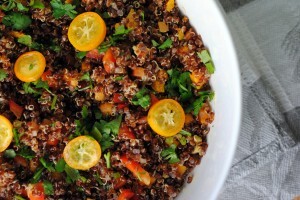 One of my favorite ways to prepare it is as a quinoa salad mixed with whatever vegetables I have around at the moment. I find quinoa incredibly filling, so this could easily be a full meal (I often do this for lunch) but for dinner I like to pair it with grilled chicken or some other protein. The maple syrup adds only a subtle flavor and works nicely with the quinoa. Chopped kumquats were a special addition this time because, as I’ve mentioned, I’ve got lots. If kumquats aren’t available toss in some lemon zest instead for a similar effect. My favorite is red quinoa, but any variety will work here. Soak the quinoa in hot water for 5 minutes. Strain and rinse. Put in a pot with the 1½ cups water and bring to a boil. 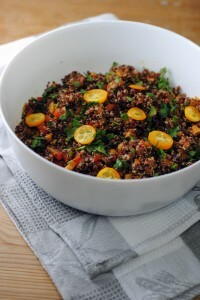 Lower the heat, cover, and cook until water is absorbed and quinoa is tender, about 20 minutes. 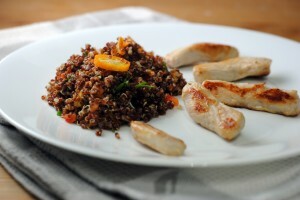 woww, i love quinoa and this looks so fresh and tasty. Love your blog!